Q: According to reports, President Ueli Maurer of the Swiss Confederation wrote an article saying that China-Switzerland relations boast a long history and the mutual understanding and cooperation between the two countries are developing steadily. In the pluralistic, complex and interdependent world, China and Switzerland have set a role model in addressing global challenges. What is your comment? A: China appreciates the relevant positive remarks of President Maurer. Now China-Switzerland ties are growing with a sound momentum. You may still remember that at the beginning of 2017, President Xi Jinping paid a successful state visit to Switzerland, during which the two sides reached a series of important consensus. The two countries are presented with new opportunities for enhancing cooperation in such areas as the Belt and Road Initiative, economy, finance, free trade and cultural and people-to-people exchanges. Now the international landscape is faced with many destabilizing factors and uncertainties. Against such backdrop, the China-Switzerland mutually beneficial and friendly cooperation has delivered tangible benefits to the two peoples, fueled the development of China-Europe relations, and sent out the positive signal of jointly upholding multilateralism and free trade. You all know that Vice President Wang Qishan is now on a visit in Switzerland. This visit marks a good beginning in China-Switzerland high-level exchanges in 2019. The Chinese side hopes that through this visit, the two sides will further implement the important consensus reached during President Xi Jinping's visit to Switzerland, maintain close high-level exchanges, enhance political mutual trust, deepen the China-Switzerland innovative strategic partnership and engage in closer cooperation at bilateral and China-Europe levels. Q: Today former diplomats and scholars from a dozen of countries sent an open letter to the Chinese side, requiring China to release the two Canadian citizens recently detained in China. What is your comment? A: I have noted the letter you mentioned. It was sent by Canada and some of its allies. The former diplomats from seven countries and scholars of several countries have committed at least two mistakes. First, they equated those who undertake research and normal exchanges between China and other countries with the two Canadians who were taken compulsory measures by the Chinese national security agencies for activities endangering China's national security. This is disrespect for people who are committed to promoting normal and friendly exchanges between China and the rest of the world. Second, they interfered in China's judicial sovereignty. They attempted to mount pressure on China by publicly making their request to release the two Canadians who are under investigation in accordance with the law by the relevant Chinese departments. This is disrespect for China's judicial sovereignty and the spirit of the rule of law. I want to stress once again that China welcomes all foreign citizens, including former diplomats, scholars and ordinary people, to conduct normal and friendly exchanges in China. As long as they abide by Chinese laws and regulations, there is nothing to worry about at all. Q: Since December last year, many Sudanese cities have witnessed prolonged protests against President Omar al-Bashir. The relevant parties believe that the Sudanese government overused force against protesters. What is China's view on this? The official from the Permanent Mission of China to the UN recently advocated easing sanctions on Sudan at the Security Council. What is China's consideration behind that? Do you think that easing sanctions will to some extent aggravate the Sudanese government's oppression of protesters? A: Sudan is a friendly country to China. We respect the efforts made by the Sudanese government to deal with the relevant issue in accordance with its domestic law. We hope that the Sudanese government can properly handle the relevant issue and maintain internal stability and peace. 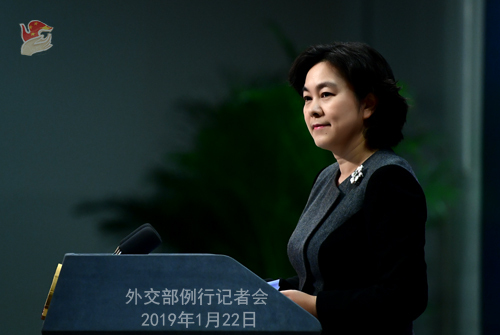 As to the statements made by the official from the Permanent Mission of China to the UN, China always believes that sanction itself is not the end. We hope that all countries can enjoy peace and stability. Q: According to reports, the Canadian Ambassador to the US said in an interview that the US side has told Canada that it would formally seek the extradition of Huawei financial officer, Meng Wanzhou. Canada would not like the US to deal with the Meng Wanzhou case through judicial means as it is the Canadian people that will be punished. What is your comment? A: China has made clear its solemn position many times on the Meng Wanzhou case. Anyone with normal judgment can see that the Canadian side has made a serious mistake on this issue from the very beginning. The Meng Wanzhou case is obviously not an ordinary judicial case. Canada and the US arbitrarily abusing their bilateral extradition treaty severely infringes upon the security and legitimate rights and interests of Chinese citizens. We urge the Canadian side to immediately release Ms. Meng Wanzhou and earnestly ensure her legal and legitimate rights and interests. 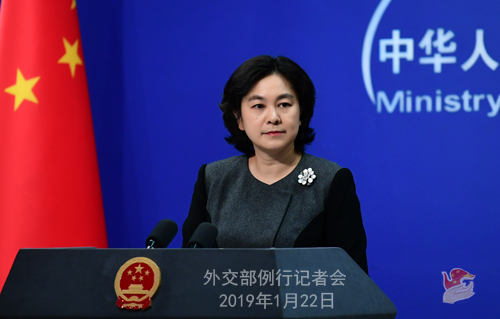 We also strongly urge the US side to immediately correct its mistake, withdraw its arrest warrant for Ms. Meng Wanzhou and refrain from making formal extradition request to the Canadian side. Q: Does China believe that Canada should follow its judicial procedures as required under the extradition treaty with regard to Meng Wanzhou, if the US submits the formal request? A: I believe that all countries, including Canada, should truly respect the spirit of the rule of law. China has made clear its solemn position many times. The Meng Wanzhou case is a serious mistake from the very beginning. It is obviously not an ordinary judicial case. Instead, it has abused the bilateral extradition treaty between the US and Canada. Q: One of the things that open letter contained was a concern that constructive academic and foreign policy work is unwelcome and even risky in China. You said again today that China welcomes foreign citizens to conduct friendly exchanges in China as long as they abide by Chinese laws and regulations. But are you concerned that just does not appear to be the message that people are hearing? A: Do you know that how many scholars, diplomats and former diplomats are now shuttling between China and other countries to promote research and mutual understanding and cooperation? I believe the answer is more than the two Canadians Michael Kovrig and Michael Spavor, and more than these former diplomats from the seven countries and scholars of a few countries. So, they are in no position to speak for those who remain committed to promoting normal and friendly exchanges between China and the rest of the world. China is the safest country on earth. Safety and freedom in China are guaranteed as long as no violations of Chinese laws and regulations are committed. These people are deliberately creating a sense of panic. Have they been threatened in China? Do they want to be grouped with those that are being investigated by China's national security departments on suspicion of engaging in activities that endangered China's national security? If the answer is no, then they attempted to confuse the public by purposefully equating the two groups of people. They issued this letter to pile pressure on the Chinese side. Do they wish to see an open letter undersigned by the 1.4 billion Chinese people addressed to the Canadian leader? I believe that the voice for justice from the Chinese people must be much louder than the sound made by just over one hundred people. Q: Canada's former intelligence chief called on Canada to ban Huawei, citing China's treatment of the two detained Canadians gives reason for suspicion that China might abuse access to Canadian telecom infrastructure. What is your comment? A: I really don't want to make any further comments on this non-sense. I saw some foreign netizens who wrote ironically that the US and Canada are now so obsessed with suppressing China's hi-tech companies and so worried about Chinese companies' spying activities that it suspects that China-made forks might be used for spying purposes. I just wonder whether they can go any further in pushing ahead such a ridiculous logic. We keep stressing that security issues need to be backed up by facts. The US, Canada and several of their so-called allies have been going all out to create a sense of panic worldwide to the effect that whoever uses China's hi-tech communications equipment will be spied on by China. But, do they have any evidence?! No. If they can offer no evidence, they'd better halt their ridiculous blabbering which only makes them a laughingstock for all. Q: If the US does follow through and extradite Meng Wanzhou, should the US expect retaliation from China? 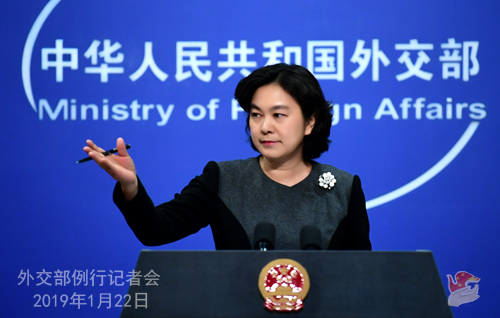 A: With regard to this issue, as early as on December 9, 2018, Vice Foreign Minister Le Yucheng has made it clear when he summoned the US Ambassador to China. What the US has done, with its egregious nature, severely infringes upon the legal and legitimate rights and interests of Chinese citizens. China is firmly opposed to that. We urge the US side to take seriously the solemn position of the Chinese side, take measures to correct its wrongdoings and withdraw its arrest warrant for the Chinese citizen. China will make further response in view of the actions taken by the US. Q: You said that Canada and the US had colluded to abuse this extradition process. Could you explain a bit more about the motivation for that? What end do you think they might have done that to achieve? A: You are a senior journalist. You should have known the answer. Anyone with normal judgment could see through the nature of this issue. The flagrant and unwarranted suppression on Chinese hi-tech companies will be proved to be terribly wrong by history. I believe that fairness and justice will prevail. Q: If Meng Wanzhou is extradited to the US, will it affect trade talks in any way? A: Like I said just now, this case is a serious mistake and we urge the US to immediately correct its mistake. Q: There have been discussions of potential serious consequences for Canada if it does not immediately release Meng Wanzhou. Can the US also expect serious consequences if it accepts the extradition of Meng Wanzhou? A: We all need to be responsible for what we do. The same is true for a country. Be it Canada or the US, they need to grasp the seriousness of the case and take measures to correct their mistakes. Q: There seems to be increasing amount of pressure against China due to the arrest of the two Canadians. Is China prepared to bear the consequences if other nations increase diplomatic concerns against China? A: On this issue, I already said several days ago that there is no such a thing of China facing increasing pressure. Even with the open letter mentioned by Canada's Globe and Mail, there are just some former diplomats of seven countries--Canada and its six allies, and scholars from several countries. They can in no way represent the mainstream of the international community. How many countries and people do we have around the world? China alone has 1.4 billion people. Justice is on the Chinese side. I hope that these former diplomats and scholars can have some basic sense and respect the spirit of the rule of law, which is the minimum requirement for them. If they don't have this minimum level of truthfulness, how do they carry out their duties in research? Can we trust that their research results will be factual?